Looking for affordable bunk beds for kids? Want to keep the cost down so they are not too expensive but also not too cheap to keep the quality up? Well, then you are in the right place. I specialize in bunk beds that are for kids. DO NOT go blindly into buying some of those beds you find on the internet. There are far too many products that are just not qualified enough to even be on the market. I can’t believe my eyes when I even see some of them. I don’t know how they managed to bypass the durability test, but these times are now over. Pick the ones I recommend here, and I guarantee that you that they will do the job. It’s simplistic in design, yet can give the room a modern look. As it’s made out of metal, it is quite sturdy and supports a good amount of weight. Bunk bed itself isn’t very heavy, so it can be moved around easily. For some weird reason, they don’t have any handles for the package when it’s in its shipping state. That’s why I would recommend to carry it in the room with your partner, or someone who can help. Read Also: Best Kids’ Camping Bunk Beds! The assembly itself take the usual amount of time. If you haven’t assembled beds before, it might take you a few hours. But that’s not really an issue since usually assembling something is quite fun. I remember when I built my first bunk bed for my kids – I think I was even more excited than my children. 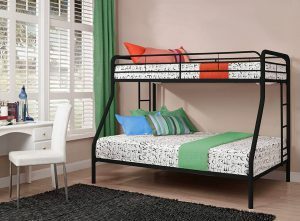 Since it doesn’t look like a typical bunk bed with standard width size, it gives you some interesting options. First of all, you can use it for kids who are of different ages or sizes. 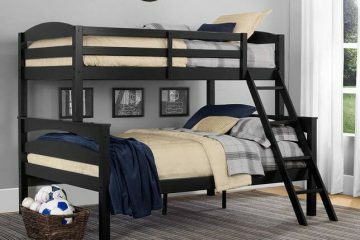 The one who is bigger can use the bottom bunk, the smaller one is suitable for the top bunk. That is because the lower bunk is a bit wider and due to that, gives more leg and wiggle room. You can also use it as a shared bed. Parent(s) sleep down below and a kid is alone up top. Although considering that “both parties” prefer separate rooms, I’d imagine it’s best to be used by children only. The makers of this bed recommend a mattress thickness of six inches. Although it has metal guards on the sides, I’d also recommend not exceeding the recommendation. If you want the BEST mattress for this specific bunk bed type, get this one 100%. It is surprisingly comfortable and kids will love it! So standard twins size for top one, and standard full size for the bottom one. But, if somehow your kids are super hyperactive, and accidentally fell from the top, there is a high chance they’ll land on the bottom mattress. Although there is little chance of your kids injuring themselves somehow at this height, it is an awesome design in my opinion. The fact that it has 2 ladders is also quite good. That way you can place this bunk bed in whatever corner you want, and kids can climb up regardless. Are there any downsides? Well, personally I recommend and prefer wooden bunk beds. There are many reasons why, but my most vivid ones are these – I like how they look, and they make less noise. The design part is a matter of taste. I cannot change it, nor can I please everyone. So take it with a grain of salt. I’ve always preferred furniture made out of wood. I was never into modern design. Wood just reminds me of nature, and that gives me this unexplainable calmness. If it doesn’t fit with what you imagine for the kids’ room, go with your ideas. The second problem that you might encounter is the noise. Metal beds are just squeaky. You cannot escape it. It’s just how it works. That’s one of the reasons why more costly beds are made of wood. So when purchasing these products, keep that in mind. 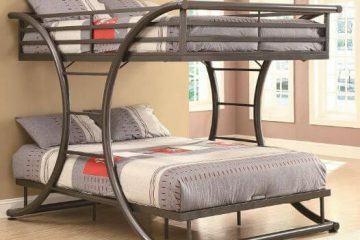 But if you also don’t like metal beds, are there other affordable bunk beds for kids made out of wood? Although it costs a bit more than my previous choice, it makes up with its material. The MAIN selling point of this product is that its material is really good for the environment, its material is sturdy, and you have many different options in terms of color. 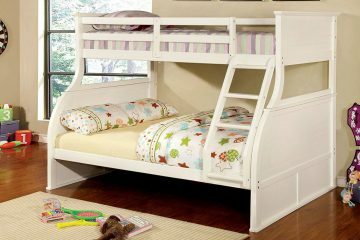 (There is also pink and white color bunk beds that cost even less). Solid rubberwood has always had quite a weird reputation in the furniture world, and you know why? Well, you probably guessed it: It’s the fact that it contains the word “rubber” in it – it pushes people away. It couldn’t even be more ridiculous. Read more here. Solid rubberwood is one of the best woods out there for affordable furniture as it holds its own in terms of durability. One of the downsides is maybe that rubberwood doesn’t have as many “natural wooden patterns” as a regular tree, but it’s usually a thing of no big deal. If you are still unsure if it’s durable for your kids, then I can safely say that is has met all ASTM and CPSC safety standards. Although I do recommend NOT to jump around like that. It has an awesome ladder that is made quite well. 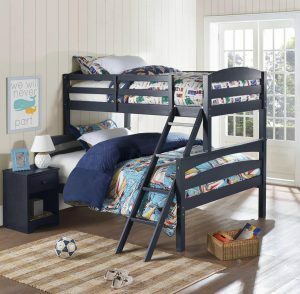 Most bunk beds have horizontal ladders, but Storkcraft (sounds like Starcraft) bunk bed ladder has a slight diagonal placement which in turn makes it easier for kids to climb up, or climb down. I remember when I was little. I had SO MANY problems with climbing down for some reason. I couldn’t position myself well for that horizontal ladder, and when I did, I felt like I was going to fall. Being afraid of heights didn’t help the matter. That’s why my kids also use a ladder that has a slight diagonal tilt to it. A really good choice in terms of design by Stork Craft. Beds are big enough to support twin mattresses, so if you don’t have appropriate ones, check out these top sellers! This bed can also be configured into two separate beds. If for some reason your kids are angry at each other, you’ll know what to do. Just disconnect the beds and place them in a different place for the time being. Trust me, a more useful feature than you think, heh. Downsides? There is one. Who has organized that mess in instructions…? That person needs to be fired. You have to be super careful, and follow EVERY instruction to absolute perfection, otherwise, something is going to be messed up. SO MANY people have complained about that. Don’t get me wrong, instructions are not misleading, but they are written in such a horrible way that it’s hard to keep up with some details. 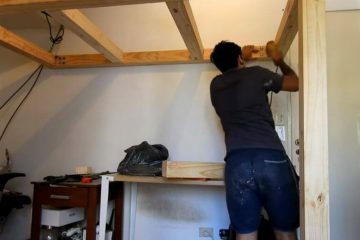 So if you are building the bed, make sure to follow every instruction correctly. Other than that, I have no problems with this bed. It is made of a good quality material, it’s simplistic in design, and even has some room under the bed, if you wish to place a trundle under it. 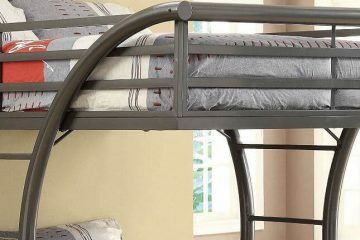 Although it’s last in the affordable bunk bed list, it does not mean it’s the worst. In fact, I prefer this one the most. It has everything you need. It’s made out of respectable material, it has many colors for your taste, and it has a great design! The design is similar to my first recommendation. The difference is, this one is made out of wood. It won’t squeak, and it’ll look better in the room (only my personal preference). You can have a completely black color, a white color, or somewhere in-between. Colors do, however, change the price. So be aware of it. Another similarity is that this one has a great ladder placement. It basically combines all the positives in my previously mentioned beds and makes it one solid, sturdy bed. Your kids will have absolutely no problems with climbing up or down the ladder. That is something many struggle with bunk beds. It’s great to appreciate a good design when you see one. This bunk bed supports 6-8 inch mattresses, so I’d recommend getting these ones (coming soon) if you don’t have any. I do love the bed, and it’s really great that it’s so affordable, but when you get it, do make sure that there are no cracks in the bed parts. A few have complained about these issues. If you find cracks, just send those separate components back to the seller, and they will send you a replacement free of charge. 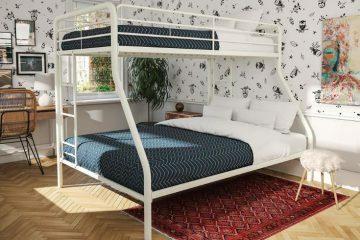 Although this bunk bed is made out of solid material, you could never be 100% sure it has no defects. Other than that, I actually love this bunk bed. It looks great, feels great, and is relatively cheap. 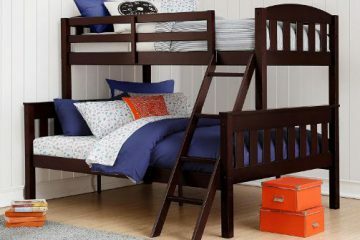 Go get these affordable bunk beds for kids! More bunk beds coming soon! If you liked this article, feel free to share and follow us on social media! Previous ArticleReview of Max & Lily Solid Wood Twin over Twin Bunk Bed – WORTH IT? Next ArticleDONCO Kids 1600TTW Mission Chest Bunkbed – GOOD or BAD? 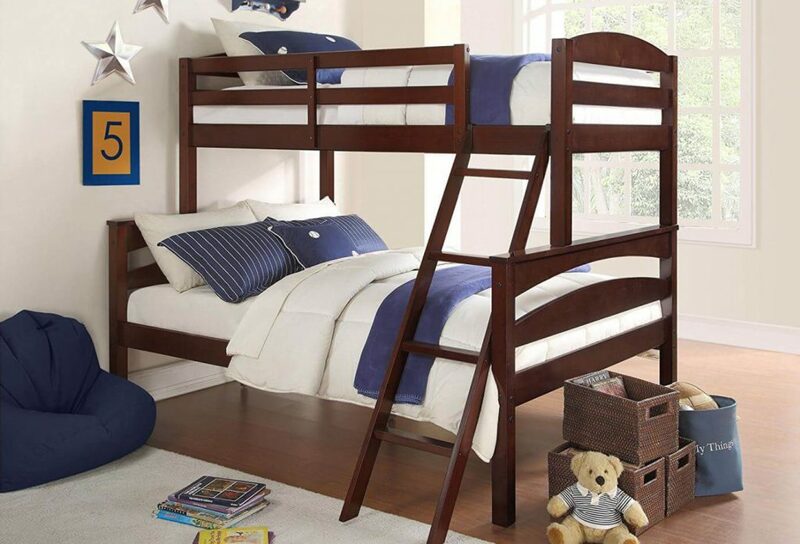 Do all these bunk beds come with mattresses also? They do not. Bunk beds aren’t usually sold with mattresses. If you want to buy a new one, it’s best to see what other people have bought with a particular bunk bed. It can be seen in the Amazon section. 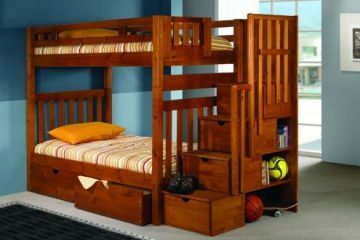 I am interested in the regular wooden bunk bed .for two girls..
A great choice! If you have any questions, feel free to ask. I’ll update my article with links to the best shop also very soon. Nice! I love the third one the most. 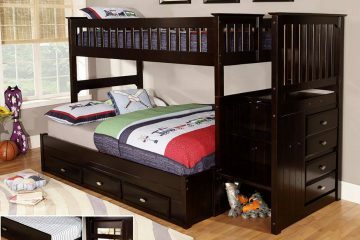 I remember we had the bunk bed when I was little, but without the wider lower bunk bed. Thinking of getting it for my kids. I hope it’s not too hard to assemble. Hi Alex, thanks for this great article. I had a bunk bed too when I was a child. I’m considering buying one of these for my kids, but my question is, is it safe and durable to mount this kind of things by yourself? 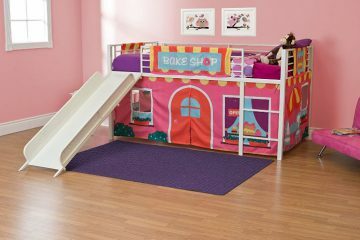 I need a strong bed for my kids and was considering buying it mounted. 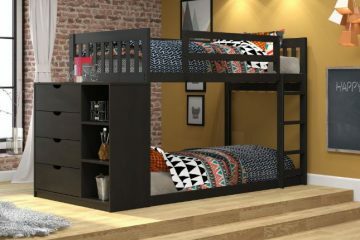 Yes, these bunk beds that I’ve listed were specifically chosen to be as strong as possible for this price. If instructions to assemble them are followed correctly, everything is going to be solid and strong! I had a similar bed where my brother and I were slipping in. I remember it was fun!. My kids have grown up, and now they sleep in a separate room. But my sister has twins, and they are still small. I will show her this article, I sure she will love the beds. Just a question, please. I did find any link that leads to the product. How can she buy the bed if she is interested? Hi, thanks for reading! I will update this article very soon with the appropriate links to the best shop! I’ve been looking everywhere for a bunk bed style that my sister and I had when we were little… where the bottom bed was perpendicular to the upper, and there were drawers built into the other half of the bottom… sort of an “L” shape with built in storage. It was a great use of space! Any ideas where I can find this style? I’m not a huge fan of the steel frame bunk beds myself… they DO make more noise! I like your compilation of “the best” here though – I think I’d lean towards the last one if I can’t find a perpendicular one. Thanks! I think I know which one you are talking about. Could it be one of my recommended ones here? And yes, steel frame bunk beds are one noisy creatures! P.S It doesn’t have link to the shop yet, I will add them a bit later! 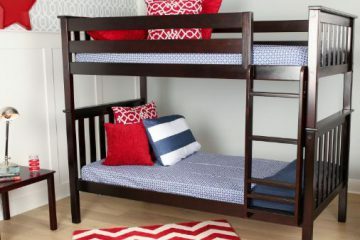 Great review on bunk beds…reminds me of my childhood as my sister and I shared a bedroom and slept in a bunk bed. Each week we took turns on who got to sleep in the top bunk. 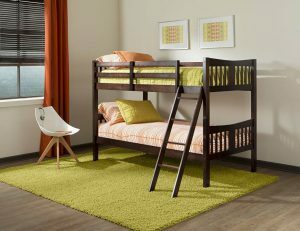 Where do you suggest the best place to purchase bunk beds and what about the prices? Yeah, I almost had an exact same childhood. My kids were arguing in the beginning also, who gets the top bunk. I will update this article soon, and show everyone where to buy them.